An Evening of Word Jazz presented by DAWG/BARR Productions and featuring music by Garretson & Gorodetsky; poetry by Mona Jean Cedar (Circuitry, Poetry & ASL*); Rich Fergusson (L. A. Spoken word artist); and Raindog (Harbor area poet & publisher). There will be books and CDs on sale by the participants. If you have any questions, please contact poetraindog@gmail.com for more details. Writing songs together since 1993, Weba Garretson and Ralph Gorodetsky have consistently explored the intersection of popular and contemporary musical ideas. They have written Woody Guthrie inspired songs for the Los Angeles Poverty Department’s production of “Utopia/Dystopia” at the Redcat in 2008; created contemporary arrangements of theater songs by Kurt Weill, Hanns Eisler and Bertolt Brecht as members of the Eastside Sinfonietta; combined deconstructed rock songs by AC/DC and the Rolling Stones with spoken word narratives in “Welcome to Webaworld” and in “Puttanesca” they collaborated with guitarist Joe Baiza to manifest a surreal dreamscape in Punk Jazz. Science and art can play well together as evidenced in Circuitry& Poetry where Jeff Boynton’s DIY electronics accompany Mona Jean Cedar’s communicative arts of dance, poetry and sign language. Ms. Cedar creates her singular multi-layered approach to spoken word and movement by composing and choreographing with sign languages, both American and foreign. (no, sign language is not universal; language is related to culture) Concurrently cryptic and clearly communicative, the highly visual-ness of sign language exponentially increases the expressiveness of the poetry and the dance. Rich Ferguson has performed across the country and has shared the stage with Patti Smith, Wanda Coleman, Exene Cervenka, T.C. Boyle, Jerry Stahl, Bob Holman, Loudon Wainwright, Ozomatli, and many other esteemed poets and musicians. He has performed on The Tonight Show, at the Redcat Theater in Disney Hall, the New York City International Fringe Festival, the Bowery Poetry Club, South by Southwest, the Santa Cruz Poetry Festival, the DocMiami International Film Festival, the Topanga Film Festival, Stephen Elliott’s “Rumpus,” and with UK-based poetry collective One Taste. He is a Pushcart-nominated poet, and also a regular contributor and poetry editor to the online literary journal, The Nervous Breakdown. His poetry collection 8th & Agony has been published by L.A.’s Punk Hostage Press. 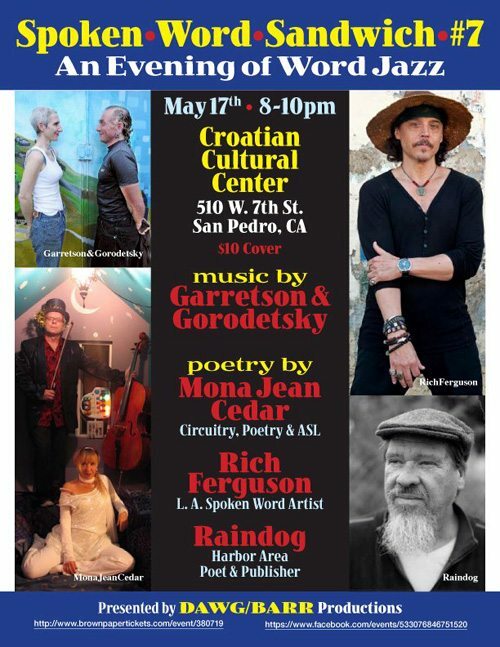 Raindog has read his poetry at venues all over the Western United States. He emerged from the Coffeehouse poetry scene in the early 90s at San Pedro’s Sacred Grounds, where he ran the poetry reading, produced a number of poetry events and started his own poetry publishing empire (Lummox Press). He later moved to Long Beach where he continues to publish books of poetry (over 100 titles to date). He cut his poetry teeth on Charles Bukowski, but studied with no one, at least not formally. He is a self-made poet, uniting his passion for poetry with a DIY approach. Raindog has 7 books and 14 chapbooks of his own work; but he has also had a hand in 5 anthologies. He started doing the Spoken Word Sandwich in the late 90s. This is the first one in almost a decade. Throughout his nearly 20 year involvement with the Southern California poetry scene, Raindog has quietly labored to serve poets world-wide. Weba Garretson and Ralph Gorodetsky perform “What Must the Hummingbird See?” a backyard song cycle of 15 short pieces about the daily occurrences of our urban wilderness where skunks, possums, owls, hawks and cats manage to thrive. The music evokes a multitude of inﬂuences — from Hank Williams to Hanns Eisler. Their program will be divided into four 15 minute sets. In between their sets, each poet (Mona Jean Cedar, Rich Fergusson & Randog) will perform a 15 minute set as well…thus the “sandwich” is created. Ms. Cedar will be accompanied by Jeff Boynton’s “circuit bending” homemade/modified electronic instruments. Rich Fergusson and Raindog may also take advantage of this soundscape. It will be a night of possibilities. This entry was posted in RD Armstrong and tagged jazz, Poetry, poetry reading, raindog by Monsieur K.. Bookmark the permalink.